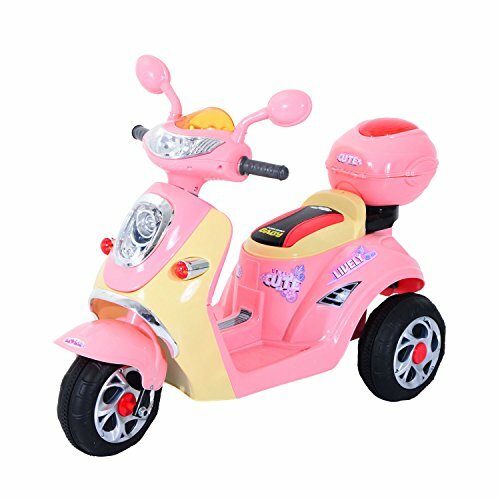 This Homcom ride on toy is a perfect gift for your child, with 3 wheel setup as a tricycle. This ride on toy is ideal for children aged 3 to 8 years of age. It is made with a metal internal frame with a plastic body, and has a weight capacity of 25Kg, with a maximum speed of 1.8Mph for a safe and stable ride. This is an ideal gift your any child. 1.86mph speed limit for a stable and safety ride. 6V Battery operated classic chopper style ride on. 1.86mph speed limit for a stable and safety ride.